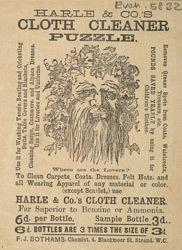 This advert for Hale's cloth cleaner, uses a very clever optical illusion to attract the observer's attention. The image is cleverly drawn and either an elderly gentleman or a couple kissing can be seen in the picture. It is this image which will catch the eye of the observer rather than the product itself, so the advert will be remembered even if the product is forgotten.